When we think about the health of our mouth we focus on our teeth. But our tongue is as important. Not many people know it, but the tongue is a highly efficient and powerful muscle. Thanks to its rich supply of nerves and blood vessels it is also a very sensitive organ. As a muscle it is an invaluable aid to speech, cleaning teeth (although it’s nowhere near as good as a toothbrush) and chewing and swallowing food. It’s one of the few parts of the digestive system you can actually see. It is amazingly agile, moving when we eat and talk. The length of the average tongue is 10cm but the size and shape can vary and still be normal – the tongue is unique in that it has the ability to shrink or grow depending on its surroundings. If you lost all your teeth, the tongue would fill all the available space, but if you had dentures fitted after being toothless for years, it would shrink to an appropriate size. Tastebuds are found all over the top and sides of the tongue, allowing us to taste anything we consume. While the tongue and teeth are working together to chew and swallow our food, the taste buds are reaping the flavour rewards. According to traditional Chinese medicine there are five taste buds – bitter, sweet, salty, sour and spicy. This still stands true, but modern science has identified another taste – umami – which is a sort of meaty savoury sensation. Contrary to popular belief there is no such thing as a tongue map or distinct zones for discerning between the various tastes. But even though science debunked this in 1974, wine glasses are still often misleadingly sold with the promise that they will direct wine to a specific part of the tongue. Some people have been blessed with an abundance of taste buds. They are often referred to as super tasters and while they’re not necessarily connoisseurs they are very sensitive to certain tastes, which could explain how cheese experts can sample a really smelly cheese and know exactly when and how it was made. It used to be common practice to use the tongue as an indicator of health. Today, this thinking is not so prevalent, and many consider it to be a very unscientific way of diagnosis. This is a common condition, which creates a characteristic appearance instantly recognised by experts. The top and sides of the tongue develop irregular, smooth red patches, which look like the outline of a map and these are usually edged with wavy white lines. Often, after a few weeks (or sometimes months) the position of these lines and red patches change, which is why the condition is called Erythem migrans. It is a harmless, benign condition that isn’t linked to any infection or cancer, but about one in 10 people with geographic tongue may have mild discomfort or a burning or painful sensation. Red lines and patches on the tongue are common in people suffering from anaemia. 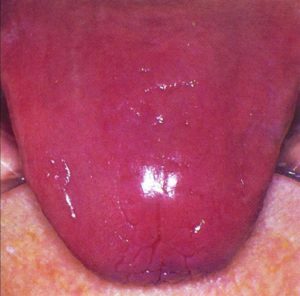 Glossitis (inflammation of the tongue) is a symptom of this; the tongue appears very smooth and shiny and this is often accompanied by a burning sensation. Sufferers of pernicious anaemia may also find their tongue swells. This is sometimes caused by a lack of minerals and vitamins such as B12, folic acid and copper. So, if your tongue is feeling less than in the pink it might be a good idea to get your iron levels checked. A sore tongue is also often a sign of a nutritional deficiency, usually vitamin B6. Another aspect you should be aware of is the coating on the top of your tongue. All healthy tongues have a natural coating due to sloughing of the surface layer. If for some reason this doesn’t shed, then a furry coating will form, giving a white or discoloured appearance to the tongue. This is particularly common in people who have a very soft diet or are suffering from a febrile illness. The colour and thickness of the coating can vary from day to day, from white to orange or brown depending on how much tea or coffee you drink and whether or not you smoke. A dry mouth may also make you more prone to a coated tongue. The general consensus is that although it doesn’t look nice there’s rarely anything sinister about it. The tongue is covered with tiny little bumps called papillae. In some people these become overgrown so it gives the appearance the tongue is wearing a fur coat. Why it’s black is a mystery but it’s thought smoking, antibiotic use, steroid therapy and iron treatment all play a part. Sufferers should be reassured that although the condition is unsightly it is perfectly harmless. 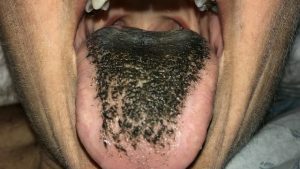 Due to its humidity, temperature and hiding niches between the papillae, the tongue is the perfect location for colonisation of Candida albicans, otherwise known as thrush. This can easily be treated with Nystatin lozenges available from your pharmacy. This is a common oral condition and appears as white lesions on the tongue (though sometimes it can be the first sign of HIV). Some women find fluctuating hormone levels during menopause can bring about a condition known as burning tongue. This condition is incredibly common and although it can be distressing it is rarely indicative of a serious underlying condition. The best way to study your tongue is to get a small piece of cloth, stick your tongue out, fold the cloth over the tip and pull it gently towards you. If you find something on your tongue that you haven’t noticed before it’s as well to get it checked out. Never ignore bumps, open sores, swellings, discolourations or persistent pain and tenderness. It may be that you’ve dipped it in something too hot but it’s best to establish if that’s the case or not. Phone us on 01548 852165 during practice hours as shown below, or by email. A handful of dark-coloured berries may lower the risk of tooth decay, a new... Periodontitis – What is it?